Letter to Rev. Hugh Lamb from unknown, n.d.
Letter to Rev. Hugh Lamb from unknown. Discusses the movie boycott. “Letter to Rev. 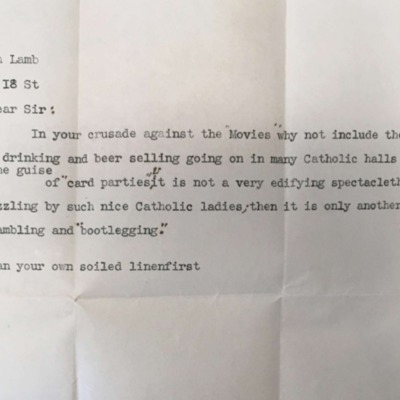 Hugh Lamb from unknown, n.d.,” Catholic Historical Research Center Digital Collections, accessed April 21, 2019, https://omeka.chrc-phila.org/items/show/7898.